Whether you've opted to install reclaimed wooden floorboards to your living room, hallway or bedroom and want to improve their appearance or simply want to give your original floorboards a new lease of life, cleaning, sanding and sealing then is an effective solution easily achieved by a keen DIYer. 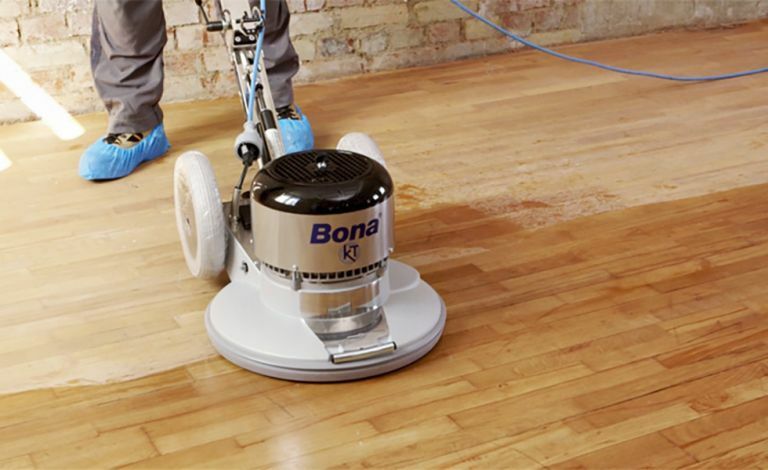 Providing a thorough guide to sanding wooden floorboards, expert Michael Holmes discusses everything from the costs of hiring the right equipment to how to use it effectively. Find more things flooring related on our dedicated hub page. After clearing the room, seal it off with plastic sheeting and tape it down to contain dust – you can also hire a portable dust partition for around £20 a week from HSS.com. Remove carpets and grippers and ensure that you drive any nail or screw heads down 2-3mm below the floor surface – not doing so will shred the sandpaper disks or belts, adding to your costs. Replace any missing or damaged boards. If you're hiring a sanding set, you can expect to pay an average of £82 for a weekend. A pack of five sanding belts in each of the six grades will be around £35-£50. We'd recommend starting with the finest grit possible, based on the condition of the wood. This said, for rough boards it's advisable to start with a coarse grit and work your way through four or five grades – from 24 to 40, 60 and 80 up to 120 grit, or it will take forever. In the case of previously sanded boards, start with a 60 or 80 grit. Tilt the machine up before starting and then gradually lower it towards the floorboards. To level the floor, work at a 15-45° angle to the grain and work left to right. Repeat in the opposite direction until the boards are level. Keep the machine moving and don’t sand against the grain. Fill large gaps between the boards first with wedge-shaped fillets of matching wood glued into place. When sanded level they’ll blend in. Vacuum and clean with white spirit ready for your chosen sealant and finish. For a high quality finish, it's wort renting edge and corner sanders that allow you to tackle these more difficult areas easily and effectively. To finish the job, use a finer grade, ensuring that you operate in the direction of the grain. On average, it takes one to two days to sand a standard sized living room. Apply your finish of choice, allowing the space two to three hours without traffic. Looking for more advice on original flooring?